Although many people associate rehab programs with support groups and psychotherapy, many alternative treatments are coming to the forefront. A meditation therapy program is one approach that shows promise for helping people achieve success in recovery. Meditation involves creating a mental state of active passivity in which you can consciously notice what’s going on in the present moment without judging it. At any given time, most people experience a lot of sensory input. They might hear people talking around them, feel cold or hot and have a complex stream of thoughts running through their minds at once. This can be overwhelming. When you meditate, you allow those sensations, including thoughts and emotions, to flow through your mind and body. You pay attention to the fact that those inputs exist without focusing on the content of the sensations. Because many people with addiction have strong emotions tied to the judgment of their behavior, a meditation therapy program can help them become aware of what they’re going through without letting it derail them from their goals. The state of empty awareness that comes from meditation shows an improvement in mental health, especially when it’s paired with psychotherapy. People often abuse substances to cope with the symptoms of other mental disorders — the fact that drugs can diminish anxiety and other negative emotions cause them to serve as psychological rewards. People continue to consume the chemicals because they make them feel better on some level. Drugs almost always make people feel worse at some point, though. Even if addiction is destroying your life on a psychological, physical or social level, you might be hesitant to quit using substances because you don’t have other tools for relaxing or reducing your aversive symptoms. That’s where a meditation therapy program can come in. It’s a non-intrusive method of reducing tension and anxiety. It can treat addiction, but mindfulness meditation also plays a role in managing other psychological conditions. It’s an integral part of dialectical behavior therapy, a type of treatment that was developed to treat borderline personality disorder, depression, eating disorders and addiction. Meditation therapy allows you to focus on the present moment instead of the demons of your past or your fears of the future. Being present without overthinking or invalidating your experience helps you develop acceptance, which is a key factor in the treatment of addiction. Many people who struggle with addiction engage with their thoughts and emotions instead of what’s actually going on in their lives. This can keep them entwined in negative behavioral patterns that come up as responses to their inner turmoil. Regulating emotions can thwart the downward spiral in which many of these individuals experience. Studies show that mindfulness meditation can change your brain activity and increase blood flow to some areas of your nervous system. A meditation therapy program can also help you improve problem-solving skills, executive function, and clarity. 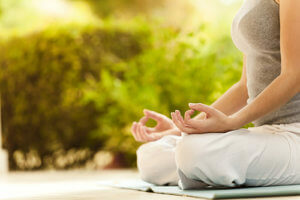 Meditation therapy may also enhance empathy and therapeutic outcomes. By using holistic, integrated methodologies, we allow our clients to heal and empower themselves on social, personal, psychological and physical levels. We aim to help you healthily express yourself while coping with stress, trauma, and anxiety so that you can create a life that’s worth living. Call us at 855-752-3377 to learn how we can help you stop the cycle of addiction in a peaceful, compassionate environment.